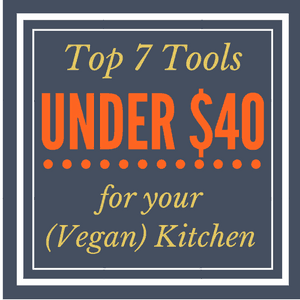 Have you noticed that this blog is called Vegan Chickpea and there is not yet one single chickpea recipe?! Oh, the irony! 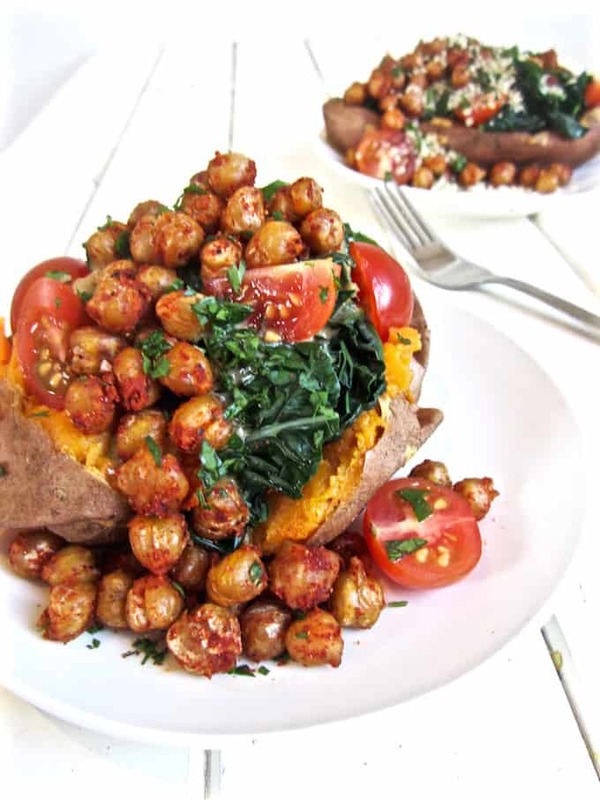 Well, that changes today with these baked sweet potatoes, crispy seared chickpeas with a little kick, steamed kale and my Best Ever Garlic Tahini Sauce from last week – all topped with cherry tomatoes, parsley and hemp seeds. Yum yum yuuuuuuumm!! I frequently get asked by people for suggestions on what meals they can regularly make for dinner that are easy, satisfying and deliver a good serving of protein. Well friends, it’s about time that I introduce you to one of my favorite meals that is super easy and versatile. This recipe delivers a foundation that you can easily make your own based on time, preference and what you already have on hand. Substituting any bean or legume for the chickpeas. If you’re short on time or just don’t feel like cooking, you don’t even need to bother with searing the chickpeas; simply rinse them out of the can or jar and either add them to your plate plain, or first mix with the seasonings and a dash of the sesame oil (or olive oil if you don’t have sesame). Substitute the Tahini sauce with any other sauce you like. Instead of kale, use spinach, bok choy, chard or other leafy greens. 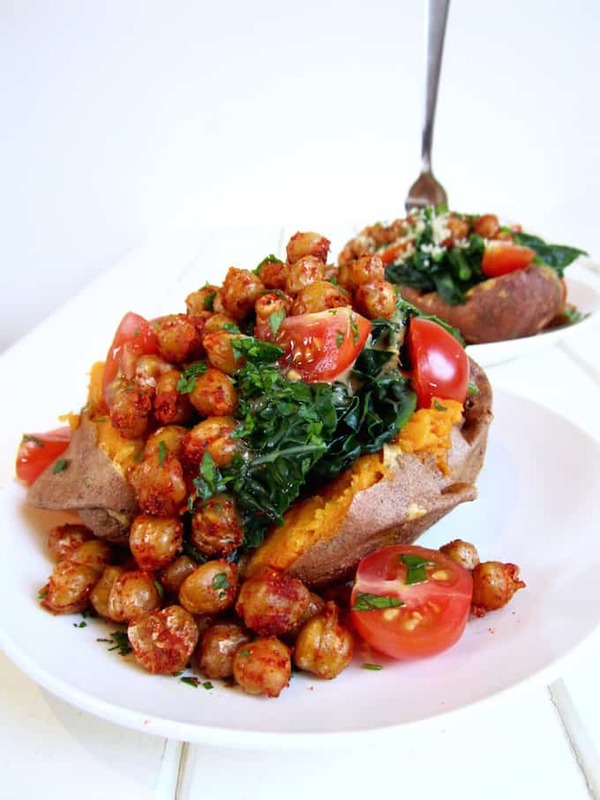 Use your own combination of seasonings you love on the chickpeas. Instead of parsley, use any other fresh or dried herbs of your choosing. Now, let’s talk about protein for a moment. 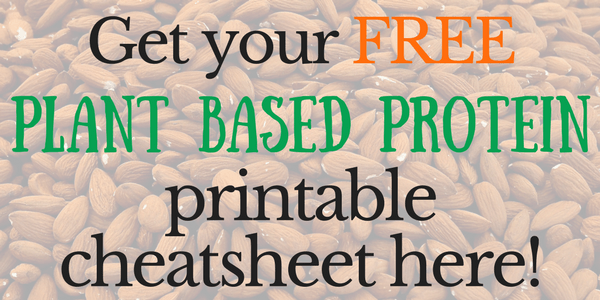 There’s a big misconception that you can’t get enough protein on a plant-based diet. I’ve learned that that’s simply not true, as long as you’re intentional about making sure you’re eating a balanced diet and adding in protein sources every single day… just like you would do on a conscious, non plant-based diet. 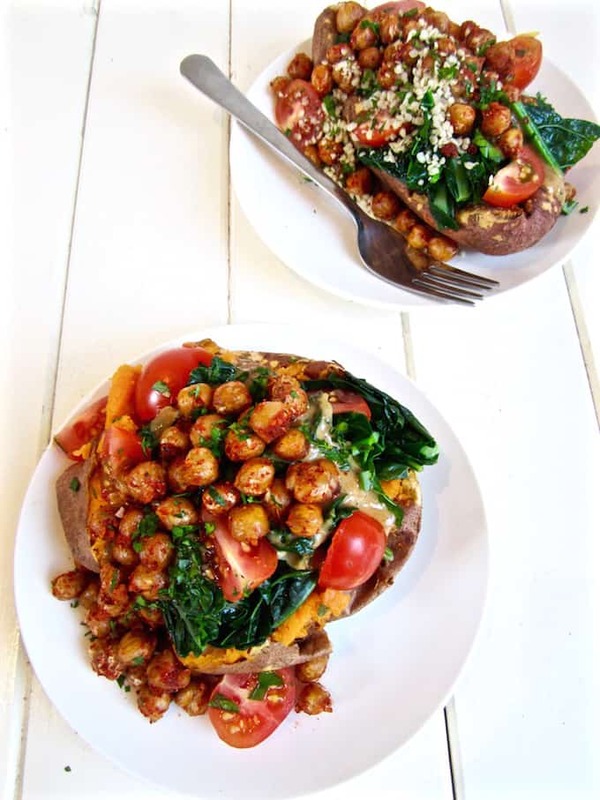 A versatile and easy weekday dinner meal with about 23 grams of protein! Make a batch of the Best Ever Tahini Garlic Sauce if you don’t already have it on hand. Wash the sweet potatoes and dry. Use a fork to poke holes in a few places on top of the potatoes. If desired, LIGHTLY and evenly spray the potatoes with a spritz of olive oil. Place the potatoes directly on your oven rack (when I do this I like to place a piece of foil on the rack beneath to catch any drips), or on a baking sheet if preferred. Bake about 45 minutes, or until they’re soft on the inside when poked with a fork. In a bowl, combine the paprika, chili, garlic powder, pepper and salt. Slice the cherry tomatoes and mince the parsley for later. Heat a pan on medium to medium-high heat. When hot, add the sesame oil, and after 1 minute, add the chickpeas. Cook 5 - 8 minutes, depending on how hot your pan is. 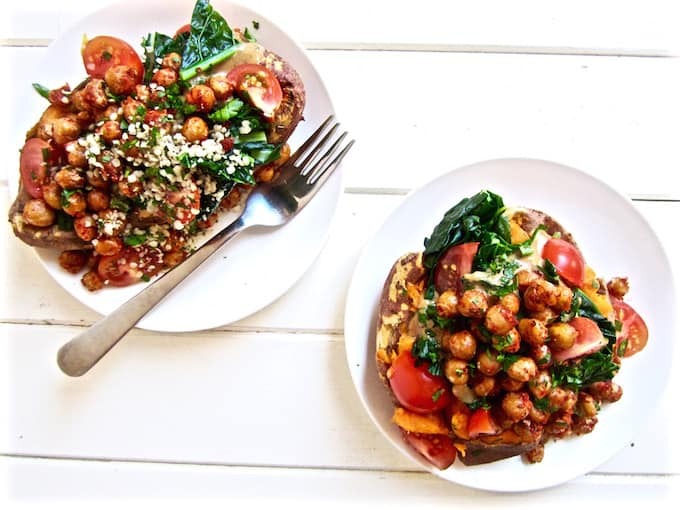 Occasionally move chickpeas around with a wooden spoon or by shaking the pan. While the chickpeas are cooking, steam the kale. Season with salt and pepper as desired. 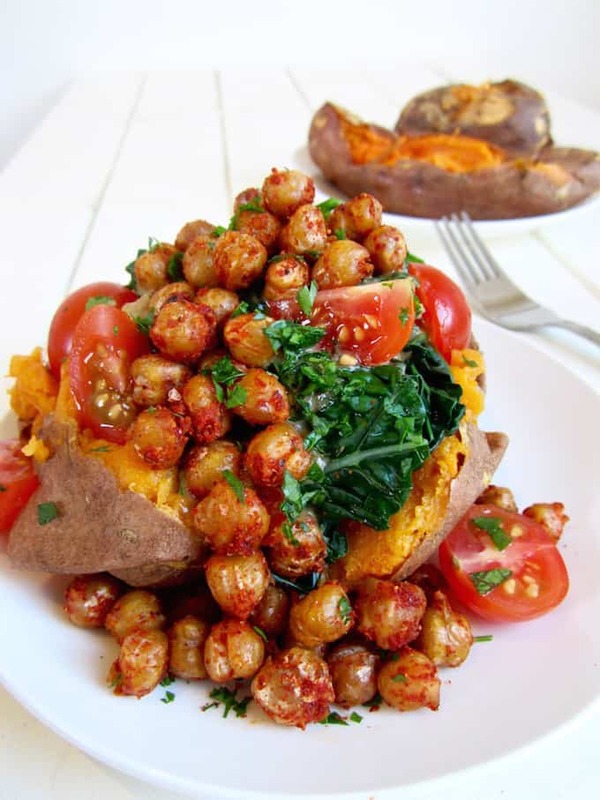 Combine sweet potatoes, chickpeas, kale, cherry tomatoes, hemp seeds and parsley and drizzle with the tahini garlic sauce.